We are a small venue holding up to 40 people. For popular events we can sell out. To book a place (and save yourself $2 pp too) call or email us. We will put you on the booking list and you pay when you arrive. 100% of your door money goes directly to the musicians as we believe in supporting live music as best we can. We serve alcohol, coffees, teas and soft drinks during the evening and offer some delicious complimentary bites during the interval. Sign up for our Notification service for music events. Jim is Flyin’ Solo across the East Coast this Spring! 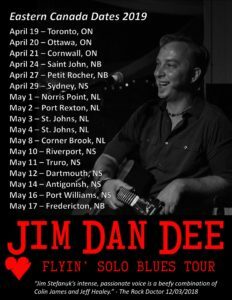 Travelling from Toronto to St. John’s and back again, Jim will be presenting his unique brand of acoustic Blues at some very intimate venues and concert halls – including Two Whales. Watch Jim play solo here.